This week at 'Tis The Season we have some bright colors to use, colors that totally made me think summer. I've said it before, I am all about the traditional Christmas colors so I had to sit and think about this for a bit. I ended up grabbing the Lots of Joy set and stamped the tree in the set 3 times...once in Strawberry Slush, once in Daffodil Delight and then once in Pool Party. I punched them out with the tree punch and adhered them to a panel of DSP that is backed with a panel of Pool Party. To incorporate the Always Artichoke I stamped the sentiment in that color. The card still seemed a bit plain to me so I did my favorite thing to add a little extra to a card, paper piercing around the edge. 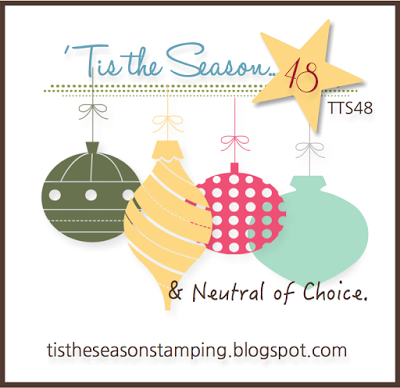 Head over to the 'Tis The Season blog to see how the rest of the DT used these colors and then play along with us!